The story of the recession has been consistently: financials, manufacturing, and automotive are the key laggards; healthcare and education have been the bright spots. Firms such as Apollo Group (NASDAQ:APOL), owners of the University of Phoenix, and DeVry, Inc (NYSE:DV) have been leading the charge as the largest players in the for-profit education sector. While the S&P 500 is down 28% since the start of 2008, Apollo Group and DeVry are up 6% and 10% respectively. It is curious as to what this will mean for the IPO of Education Management Corporation (to be NASDAQ:EDMC) on October 1st. Why have Apollo and DeVry been so resilient? Common knowledge would say that as unemployment rises, workers want to return to school to increase their skill set. Traditional non-profit universities filled this void in previous recessions; but for-profit schools (with looser acceptance standards) allow for an easy entry. Search backs this story strongly. 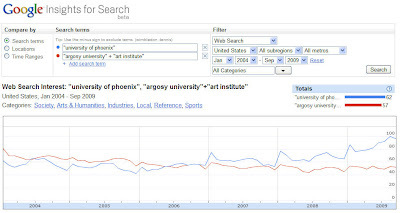 Searches for “university of phoenix” and “devry university” back the trend that their parent companies have benefited in stock price. Consumers are turning to these programs. This creates for an interesting story with EDMC whose top brands are Art Institute and Argosy University. Taking a look at searches for Argosy, it appears to follow the trend (accelerating through Q3 even). This could bode well for the $18-$22 asking price. The outlook is not as promising for the Art Institute, however. Searches for the school which builds graphic designers, among other categories, has been in a decline. EDMC reports that revenues grew 19.4% for the year ending June 30, 2009. The specific schools have not been identified, however. APOL has not released their numbers for the same time period, but through their first 3 quarters of reporting in their fiscal year, they have already met 92.2% of last year's revenue. Staying in line for Q3 revenue would put APOL at a 26% growth rate y/y. It is important to keep a pulse in the long run on where these schools lay relative to each other regardless of the direction that EDMC takes on their IPO on 10/1. When taking your picks in the education space, keep consumer interest in mind. The most telling comparison may lie in the breakout between Apollo’s University of Phoenix and EDMC’s top 2 stars. Whether you think education is a bubble or not, the searches do not lie. Apollo’s University of Phoenix does appear to be top of mind for consumers. Earlier today, Google (NASDAQ:GOOG) released a new tool on their Google Finance platform called Google Domestic Trends. The idea behind the platform is to use a bucket of queries to serve as a proxy for various economic indicators such as unemployment, air travel, credit & lending, etc. It's reassuring to see that Google is moving toward this direction in moving toward sharing their data beyond its value to advertisers and the CDC to include your average, everyday investor. It was also very interesting to see a (relatively) main stream take on the concept of using search data for investment recommendations in today's Tech Crunch. There is still a long way to go with using internet data strategies for retail investors; we are still just at the beginning of a new era. Disclaimer: Author owns shares in GOOG. Earlier this week, following a Google Insights for Search snafu, Markets with Search predicted that jobless claims would come in flat for the week (in line with consensus). The numbers released today validated the claim. Chalk one up to another win for using search to "predict the present." Looking further into the issue which resulted in the errant prediction earlier, it is to my understanding that Insights for Search data may take up to 2 days to finalize following the end of a periodic week. The initial prediction was made on data that has not been fully normalized. While this is not ideal, it still enables you to be ahead of data that is delayed by 5 days. Two weeks ago, Sony (NYSE:SNE (ADR)) announced that they were cutting the price of their Playstation 3 console by $100 to a price of $299. It has been no secret that PS3 has been the laggard of the next generation consoles (Nintendo's Wii and Microsoft's Xbox 360), but investors will want to know whether this price cut will stimulate growth of Sony's effort. Initial indications in the search space is that the price cut has in fact driven consumers to express interest in purchase of the PS3 console. Looking through call-to-action "buy" keywords, with a filter to remove searches for consumers seeking to buy "points" on these consoles, it appears that searches for interest in purchasing the Playstation console. It does not appear that Microsoft (NASDAQ:MSFT) has had as much luck with their reaction to cut the price of their most expensive console, announced a week after Sony. Searches for Xbox purchases remained flat through last week. These are still initial results and there is much left to be seen of where sales will sit once the dust settles, but the first response appears that Sony is winning this battle. Disclaimer: Author owns shares in MSFT. There appears to have been a glitch in the data analyzed for yesterday's post. Insights for Search was listing an 18% lift in popularity for key searches in yesterday's evaluation; today's data shows a different story (highlighted below). The reason for the discrepancy is currently under investigation and I apologize for the confusion. The current data reflects no major changes in the key searches, which indicates a likely flat week for initial claims, in line with consensus expectations. This upcoming Thursday, September 3rd, the initial jobless claims report for the week ending 8/28 will be released. Initial claims have been trending downward over the past weeks, which is a positive sign for the economy, as job retention has been looking fairly stable. The consensus pick for this week's data is a continuing trend downward, with an expectation around a 1.5% drop. Looking at the search data, however, indicates that there was a sharp increase in searches for key unemployment-driven queries. On July 16th, we posted the correlation between key searches for unemployment and jobless claims. While it is unlikely that this week's jobless claims release will increase by 18% (as searches have week over week), it is highly likely that the concensus pick will miss the mark in the wrong direction. On July 23rd, Markets with Search posted an estimate of where the housing starts number would move for the month of July. The post predicted that we would see flat movement in the data, which was the case. August 18th data showed that the SAAR for housing starts went from 0.582M to 0.581M. We look forward to continuing hitting these predictions in the future. 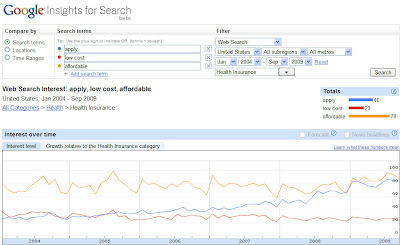 Google today posted a new insight into the predictability of where search trends will move. The study revealed that with a simple time series forecast, slightly over half of the queries on Google are able to be predicted with high accuracy. These time series analyses allow you to create a deviation away from where a predicted trend will move toward. Positive and negative misses can help you in benchmarking where a current trend is deviating toward. The other (glass half empty) view is to showcase that another half of Google queries are unpredictable. As we saw with the iPhone data, major releases can serve as an indicator of where current performance of sales is trending. This allows us to get a pulse on where the purchases move relatively. Using search data to influence your investment decisions is a happy medium between those queries that we can predict and those which roll with the tides. The Google Research Blog post shows the full white paper analysis. The MBA posted their weekly numbers on Wednesday, with refinance applications coming in at an index level of 1862. This number falls within 4.6% of the Markets with Search prediction of 1950. This gap is slightly larger than would have been anticipated. Looking to this predictive set of keywords in the future, we will be adding a more comprehensive set to provide more accurate predictions. Weekly data releases tend to have a little bit less pull in markets than monthly releases, but they can still have a strong impact. One of the strongest weekly indicators that we see released each Wednesday is the Mortgage Bankers Association Mortgage Applications Indexes. The data released on Wednesdays comes from the prior week ending Friday. While a 5 day lag may not seem like a long time, we can narrow that number by using the power of search data. Taking a look at queries on Google for “mortgage refi” and “mortgage refinance,” it turns out that these indications of interest correspond very highly to action and applications. Comparing these search indexes with the MBA’s Refinance Index, there is an R2 of 0.8121. The last release of the Refi Index came in at 2089.7 for the week ending July 17th. Data for the week ending July 24th will be released this Wednesday, July 29th. Looking at search data, there has been an 8.7% decrease in popularity in searches for this week. This should yield a similar movement in the Refi Index. Assuming that the Refi Index would follow in a similar relativity to search, this week’s index should come in at ~1950. The Bank of Israel recently posted a brief analysis highlighting how they have looked at Google Insights for Search to predict economic activity. I highly encourage reading through the white paper linked from the press release; it truly shows the power and depth you can get into when analyzing search data. In the last few months the query indices in Israel point to a reduction in the probability of a slowdown; that conclusion is based on the moderation of the decline in private consumption. The indices do, however, indicate a steep increase in unemployment in the second quarter of the year, to more than 8 percent. It is reassuring to see these kinds of analyses pop up outside of Markets with Search. Thanks for the tip on this press release, Hal. I will try to repost these articles as I come across them to point to ideas outside of MWS. Have a great weekend and happy trading. Residential real estate has been at the heart of market movements since the subprime crash dating back to February 2007. Housing inventory has been skyrocketing with foreclosures getting to all time high levels. This has put significant pressure on the home building sector. Home building has not ceased, but has significantly decreased. New housing starts in June 2009 were at a level 28% of where they were at the same time in 2005. These starts have ramifications outside of just homebuilders like DR Horton (NYSE:DHI), Pulte Homes (NYSE:PHM), and Lennar (NYSE:LEN). Suppliers for new home supplies are impacted as well. Searches for key indications of interest in the housing sector fall very closely in line with where the true number falls. Going back to 2005, there is an R2 of 0.7667 with searches for these key indicators and the true housing starts number. Markets with Search (tentative) prediction for July 2009 housing starts: flat. The numbers will be out in mid-August. Apple just released their earnings for fiscal Q3 2009. Consensus picks for iPhone units sold came in between 4.5 and 5.0 million; the Markets with Search prediction came in at 5.3 million. The final number of quarterly sales: 5.2 million. While the data points were not large to choose from, the lift in search traffic turned out to be an accurate predictor of this data indicator. Hopefully more of these predictions will reach the same accuracy in the future. Apple Inc (NASDAQ:AAPL) is set to release earnings for their fiscal Q3 2009 on Tuesday, July 21. A large part of the speculation into the shareholder value of Apple is the success of their iPhone, which launched on June 19th. In fiscal Q2 2009, Apple sold 3.79 million iPhone units globally. Predicting the performance of iPhone sales can be tough if looking simply at searches for the term “iPhone.” These searches are subject to the volatility of news, branding, and buzz around the product. An easy filter to take a peek into how sales are performing is to add call to action keywords into search terms. Since the product is global, the analysis below takes a global look at “buy iphone” searches in English, Spanish, Russian, Japanese, and German (Apple’s top iPhone market languages). While there are not yet enough data points to run a statistically significant regression on searches to sales, eyeballing the data looks quite astounding. The major global launch of the iPhone 3G in July 2008 appears to have skewed the data for calendar Q2 and Q3 2008, yet all other search movements appear to proportionally fall and predict the according iPhone sales numbers for that quarter. Taking Q2 and Q3 as outliers of the globalization of the iPhone, the most recent search numbers for the past quarter’s lift would indicate that iPhone sales will rise 40% in the earnings release on Tuesday. Markets with Search prediction for fiscal Q3 2009 Apple iPhone unit sales: 5.3 million. The coming posts to Markets with Search will provide further analysis similar to the jobless trends data. These analyses aim to provide actionable data-oriented plays on the market. Before getting into more, it is important to note some other sources that are out there for your reading. I’ll be posting these kinds of articles intermittently. The Chief Economist of Google, Hal Varian, has published “Predicting the Present with Google Trends.” This whitepaper embodies the power of the real-time nature of internet data; we can increase transparency into lagged data. In this post, Varian explores how to predict auto sales, home sales, retail sales, and travel behavior using the wisdom of the online crowd. All of these factors can issue trade ideas. Play around with your ideas on Google Insights or Microsoft xRank. Enjoy the light weekend read. Have you ever wanted to get ahead of data before the official release to the street? Have a play based on the numbers? The time has finally come. After doing some backtesting, some content has been geared up and ready for release. Today’s trend: using Google to predict where seasonally adjusted job claims will turn… with 88% confidence. Consumers turn to the search engine juggernaut to indicate interest in topics that have been on their minds, making it the world’s largest focus group. One of the most interested topics of 2009: What do I do if I just lost my job? Answer: search for filing unemployment. With an R2 of 0.8815, searches for “file unemployment” and “filing unemployment” fall right in line with actual seasonally adjusted Initial Jobless claims for a given week.